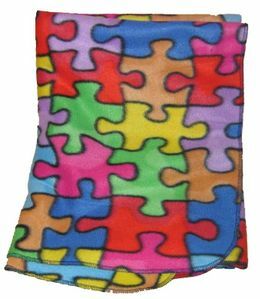 This autism classic fleece blanket is light and cozy. It is a one ply piece of fabric that was hand sewn carefully around the edges. It measures 4 ft. long and 2 1/2 ft. wide. This blanket has the same colorful print on both sides. Great for the car, stroller, school, etc.